I told you all I love these machines... 6 of these are usable loved machines, one is a parts machine (top right). 2 Aristocrats, 1 Arrow (round keys, a 1939), and 4 Quiet De Luxes including the parter. Great thoughts, and sentiment, Mark. Likewise with our homes, and great architectural, and historic buildings, as well as old trains, planes, and cars.....we are their guardians, and hopefully maintain, and cherish them and then pass them on to future generations to love, and enjoy! 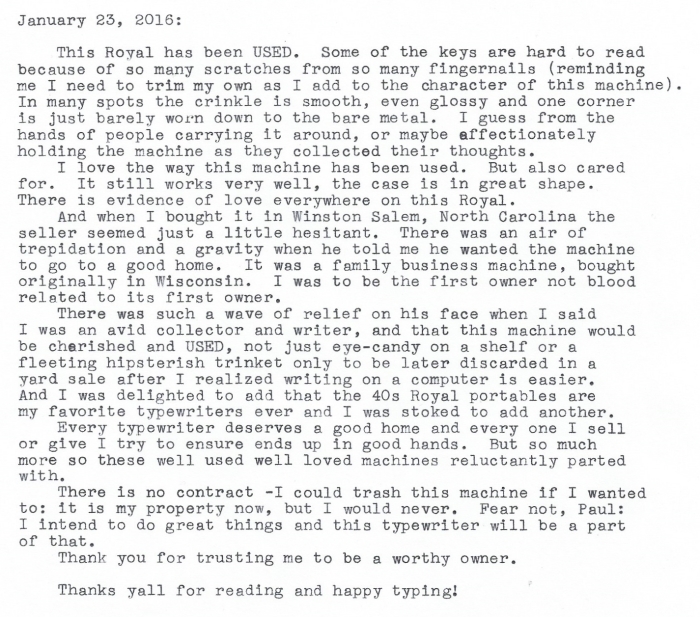 I've never typed on a '40s-era Royal. Sounds like something I need to look for at my local thrift and antique stores. You certainly owe it to yourself! Everyone's tastes are different but you do need to try one. It sure feels good to know that you're writing a new chapter in the life of a cherished thing. I've got to agree, those old 1940s Royal typewriters are a joy to use. Congratulations on getting one that you know the history. Good to know it was so well liked by its previous owner also. This is how I see my Olympia Robust. I am it's steward. I am protecting the reality of history. That's still at the top of my want list. You're very lucky.